Dennis and I want to thank you for our beautiful Mia! After our wonderful cat of 10 years became ill, we lost her Christmas 2018 and were just so sad. We always called her our “faux” Siamese as she truly looked to be one, but we Had no way of knowing really, but she was so much a great cat! My husband has wanted another Siamese since he had one in his college years( along time ago). 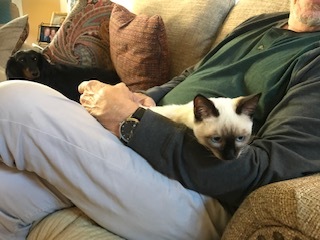 Our house just wasn’t the same without a cat, so I searched for a kitten and contacted Lynn at Southern Traditional Siamese and Balinese, to find that she had a female just suited for us. Two days later, we drove to Ponchatoula, LA to pick up our beautiful Mia! We want you to know that she is just the most special kitten ever! She took right to her litter box, her new bed, new toys and especially our laps. She is so agile and funny and almost immediately played with our Border Collie Sadie and our Dachshund, Nona. They are having a great time together. She is a purring machine! Needless to say, your Cattery certainly produces such well adjusted kittens and we are so thankful for you. As an artist, I certainly enjoyed the opportunity to paint your special cat, Beezie. Your story about attaining him was just the sweetest! Thank you again for our dear Mis. We had just lost our little Siamese that we had had for 15 years and we were heartbroken. We discovered Southern Traditional and spoke with Lynn and she had a little boy that would be ready in 3 weeks for pick up. We were ectastic. We picked him up in May and fell in love immediately. His disposition is so sweet & all our friends comment about how friendly he is. After a few months we decided we would love for Joe to have a brother to play with & keep him company. So I looked on the Southern Traditions website and there was a kitten that was 6-8 months old that was available. We called Lynn & told her that we wanted him. My husband made the trip to pick him up & while he was there visiting with Lynn - playing with the kitten, etc - Lynn decided that the kitten might not be the best fit for us. So she offered another little male that she had left from a litter. This is a true testament to how well she knows her cats. This little boy -Scooter - and Joe are perfect for our family! They are the best buddies and are always side by side. They have the sweetest dispositions, great lap cats & very outgoing. Most people expect Siamese cats to be standoffish but Lynn's cats are so friendly. Recommend Lynn and her cats highly. We will be forever grateful! After our Siamese cat of 13 years was diagnosed with kidney failure and died, we were heart-broken. Our home felt very empty. My husband and I knew we wanted to get another little companion in our family but couldn’t find the right one. We also had reservations about what we would feed him, because we were concerned that the food we fed our other cat may have caused his problems, even though the vet recommended it. We found our new little baby boy at Southern Traditional Siamese and Balinese. We named him Pai (pronounced pie), it means the cutest. Lynn was so helpful in the first few days while we were adjusting to our new addition to our family. My brother-in-law was here on a visit from Colorado, he is not a pet person, but he couldn’t stop playing with Pai. He actually would go search him out to pet him. Pai is such a character, he loves playing with his feather “da bird” toy. Lynn did a great job socializing him, so that when he came to us he just needed to get familiar with his new routine. He runs and cavorts around the house like he owns it and he does. My husband and I are so happy that we found Lynn at Southern Traditional Siamese and would recommend Southern Traditional to everyone who wants a healthy happy kitten. I hope this email finds you well. 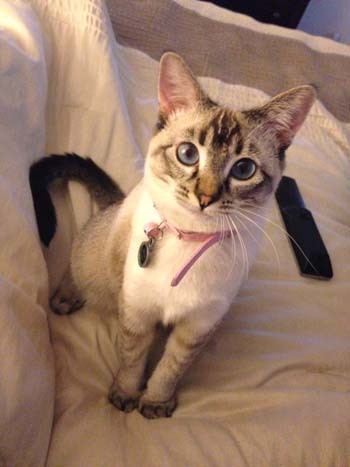 I wanted to update you on my Siamese lilac point, Maeby, that I adopted from you in early June 2013. At 2 years and 2 months old she is a beautiful 8lb kitty. She has remained very light in color and her personality is everything I could have hoped for. Maeby is very social. She befriended our West Highland Terrier and spends a lot of time teasing her. I think she prefers spending the day surrounded by people. Maeby strongly disapproves if she's left out of a conversation! For instance, if I shut the door to the office to make a phone call, Maeby will cry and paw at the door to let me know she wants to participate too. She only gets vocal when it's time for breakfast or she wants to be in the room with me. Anything new I bring into the house whether it's a grocery store bag, a box, or freshly washed sheets on the bed... Maeby immediately claims the new object for herself. She is spayed and in very good health. Everyone comments on what a stunning cat she is from her lilac points to her fluffy soft fur. Most of all everyone raves about her gorgeously rich baby blue eyes. My favorite thing about her is the training you invoked with the bell. Maeby is never lost! It's such a joy to be able to make a noise with a bell and have her come running ready to play! I wasn't sure what to expect adopting from a breeder, but you have made me a life long believer in Southern Traditional Siamese. I am so thankful to have her in my life. I hope to adopt another one of your precious kitties someday. For Christmas 2013, my husband & I, brought home a new addition to our family. After two years of researching Siamese breeders and the different "points" that are produced, we became very intrigued by the unique "Lynx Points". Lynn was such a pleasure to do an adoption with. She would text us updated pictures of Bella and two videos of play time with her. When pick up day came, I arrived to her and all the other felines greeting me at the front door step. She then went to retrieve Bella and said, "Are you ready to fall in love?". When she placed her in my arms, I did just that. I knew from that moment she was everything we wanted. She's 10 months old now and still amazes us daily on what she learns. From opening up her food cabinet door by herself, to playing fetch and even playing the "Friskies" Jitter Bug Cat app on our iPhones. She has the most playful tactics at times, bringing us so much laughter. She has now matured into a loving, poise female with such beautiful markings. Also, a HUGE part of our family which includes, her 9 year old sister Kandi, a black lab! This past July my niece acquired a Balinese, Tye, from Southern Traditional too! He is the sweetest, most gentle little man. She received him for her 5th Birthday present. He snuggles with her every night to Frozen before Bed and wakes her up with the morning sun, kissing her forehead. He will snuggle with just about anyone! I will say although, we have only have purchased Lynx and Balinese, everyone of her cats on the premises are so affectionate. They all make a point, during your visit to get some loving' and purr for their guest of honor! Bella does the same to each guest at our home, so that goes to show her passion and love she instills into each kitten before they are adopted. We highly recommend her to "cat lovers" often. In the 10 months since our adoption there, I now know 2 other happy parents of a Southern Traditional Siamese Cat. I have had Siamese cats since before I went to Vietnam in 1970. They are wonderful animals and their loving character traits, are known and well documented. Last October, it became apparent my thirteen year old Siamese was having medical problems, and that I may need to find a replacement. 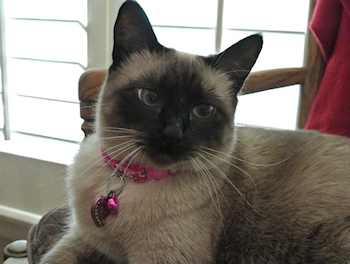 A search on the Internet, produced the website "southerntraditionalsiamese" out of Lousiana. I contacted Lynn Schwamb of that cattery, in hopes of finding another kitten. It makes me smile to think of it as she had no "current inventory", because of her excellent reputation for producing quality Siamese. So I had to wait until December when on my birthday, my female seal point kitten Daisie, was born. We got her when she was ten weeks old, and delivered into a house with two other cats and a dog. She adopted immediately the dog, her absolute best friend. She is the most athletic, agile, precocious cat I have ever had. She sits in my lap, sleeps in my arms, and kisses more often than any cat I have ever had. She is the product of the way Lynn raised her from birth, and an incredible animal who has brought happiness to all in this house including the other animals (Custer is now doing well thanks to the vet), and us. We were extremely fortunate to find Lynn's cattery, and beyond fortunate to have Daisie who is now seven months old and a beautiful, gentle, loving cat. Last October I tragically lost my precious Lynx Point Siamese. I was (to say the very least) devastated. I didn't know what I was going to do. I did know I had to have another cat, another Lynx Point and I wanted a kitten. I did not realize that finding one was not going to be an easy task. I searched online and found Southern Traditional Siamese! I emailed the owner, Lynn, and she informed me that her Lynx Point, Molly, had a litter of five kittens just a week earlier!! I was of course excited, but there was no guarantee there would be a Lynx Point in the litter. Still, I sent her a deposit and then waited. In a few weeks Lynn informed me that the one male in the litter and the largest kitten, was a Lynx. I wanted a female, so I had to keep waiting. Ugh! Finally, the smallest kitten turned out to be a Lynx and Lynn sent me a picture. She was beautiful And I loved her already. I quickly made flight plans to go and get her. So the Saturday before Christmas last year I flew from Sacramento to New Orleans to pick up my treasure! Lynn's husband was at airport waiting for me with my kitten. The rest is history. I named her Narcisse Francais which means French Daffodil and I call her Narci. Besides being extremely healthy and beautiful, she is truly the light of my life! I cannot thank Lynn and her husband enough for filling a huge hole in my life. Lynn did everything she said she would do and more. If I wasn't happy with Narci being an "only child", I wouldn't hesitate getting another cat from Lynn. I highly recommend to anyone who wants a cat get a Siamese and of course select one from Lynn's cattery!!! 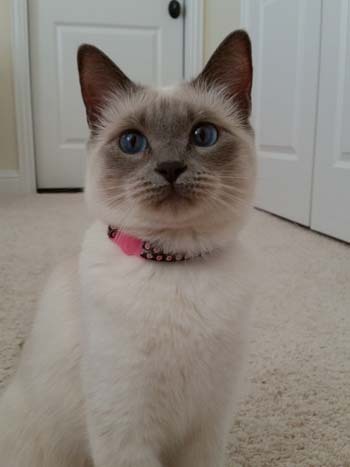 After searching far and wide without success for a healthy Siamese kitten here in Texas, my husband and I decided to adopt a seal-point female from Southern Traditional Siamese in Ponchatoula, Louisiana. What luck! We could not be happier with our Midori. From the very first day, she has been healthy and well- socialized. She made herself at home immediately, greeting her two older “brothers” with a friendly curiosity that they could not resist. They are now all truly best buddies. 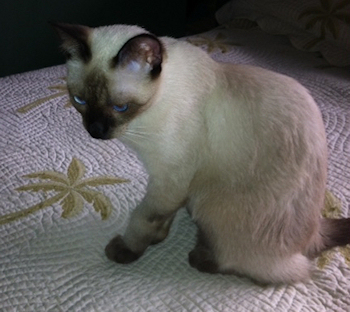 She is a quintessential Siamese – very playful and energetic with an extremely sweet disposition. She always greets us at the door when we return from work and loves to follow us around the house, watching me cook in the kitchen or listening to my husband practice his accordion in the music room – now that’s devotion! Midori is mischievous and intelligent and a constant source of amusement and pleasure. She is a beautiful girl with deep blue eyes that always capture peoples’ attention. I cannot say enough about what a great cat she is and how much we adore her. She is without a doubt the sweetest female Siamese we have ever had. I feel very fortunate to have found the Southern Traditional website. Lynn was friendly, professional, and easy to work with. I would unreservedly recommend her kittens to any Siamese lover. I wish I could put into words my feelings about our new addition to the family. Ping has the sweetest disposition. He is full of curiosity and there does not seem to be anything that frightens him. When we have visitors he's looking to see who it is. He has plenty to talk about; especially in the mornings when he demands a full rub down and nose scratch. He is a gorgeous Siamese with beautiful seal points. All of Ping's traits are a tribute to the love and care that you give to your family of Siamese. It is clear that the attention and nurturing you give your sires and 'queens' shows in the quality of their offspring. We are so happy to have found you. Thank you. Izzie's coloring is just gorgeous and my experience with Southern Traditional Siamese was outstanding. Her father is Mojo and she is very much leaning to the “plus size” of the family. Her sisters are two Golden Retrievers and in many ways she is just like a dog. Izzie’s meow is very very quiet and she is as sweet as can be.